BioSil claims to promote unbreakable nails and help thicken hair and has two published studies to back its claims up, but the quality of the studies and the quality of the results are what really count when evaluating a product. The ads for BioSil look and sound like every other supplement ad. There are bold claims like “promotes unbreakable nails” (I’m pretty sure that’s impossible); references to science like “molecular biologists have pinpointed the key structural protein…” and “your own DNA fingerprint”; and a blond celebrity (Christie Brinkley) smiling while talking about how this product, in particular, has changed her life. 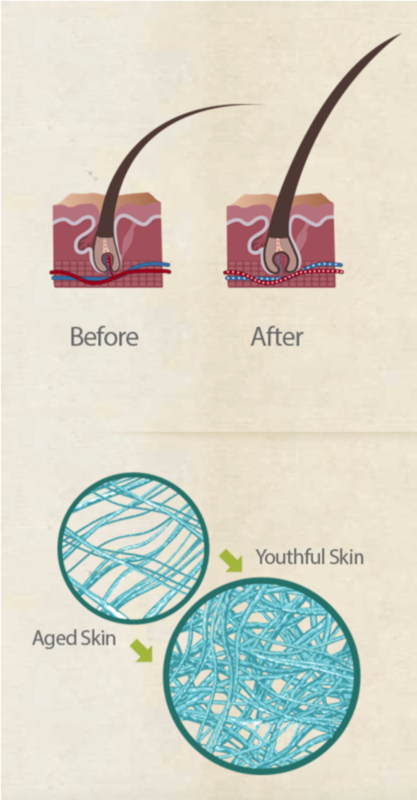 The BioSil website features the familiar refrain “This statement has not been evaluated by the Food and Drug Administration” after every statement about their product, as well as snazzy scientific-looking pictorial representations of what it can do for you. BioSil is manufactured by Natural Factors. Their site features images of sprawling fields and a cross-section of a grassy patch complete with worms. Everything about it inspires thoughts of nature, because natural is always better, right? Too bad their site also says “You should not use the information on this site for diagnosis or treatment of any health problem or for prescription of any medication or other treatment.” I would definitely call a supplement for “Rejuvenating your hair, skin, and nails” a treatment, but what do I know? The active ingredient in BioSil is choline-stabilized orthosilicic acid (ch-OSA). Orthosilicic acid is just a silicon atom surrounded by four hydroxide (OH) units, but it is unstable on its own. Enter choline. Choline is an essential nutrient for humans that most of us consume more than enough of every day (it’s found in everything from cauliflower to tofu to chicken to almonds). In BioSil, choline serves to stabilize the orthosilicic acid. BioSil’s website constantly references clinical trial results, so I read the two trials in question. It's important to note that we can't take these studies' conclusions at face value. Not all studies are created equal. There are a plethora of issues that can hide in a study’s design that could call its conclusions into question. We need to evaluate the design and procedures of a study to know whether we can trust its results. That’s not always an easy task, so let me help. The first study involved 48 middle-aged, white, healthy women with fine hair (as determined by the study’s hairdresser). 24 of the women were given a placebo, while 24 were given 10 mg of ch-OSA orally for 9 months, during which they did not heat or colour-treat their hair. The 45 women who finished the study had the diameter and tensile strength of their hair measured at the beginning and end of the treatment. What does P = 0.027 mean? Let me try to explain. When a scientist writing a study says that something is significant, it is not the same as when I yell at my TV that the colour of the Monster’s hair on The Masked Singer is significant. Significance in science actually refers to statistical significance, which is measured with something called a p-value. It’s a controversial way to measure significance but has been something of a standard for a long time (though that is slowly changing). You can click below to read about how p-values work and why they are so confusing, but to evaluate this product all you need to know is that if something is statistically significant, we can say that it is meaningfully different from something else. For example, we could take a hair sample from someone in the ch-OSA group at the beginning and end of the 9-month period and compare them. A statistically significant result would mean that they are significantly different, i.e. that the thickness of the hair changed in those 9 months. We could also compare the hair of someone using ch-OSA to the hair of someone using a placebo at the end of the 9 months. A statistically significant result here would mean that whatever happened to the hair with ch-OSA did not also happen with placebo. So how do we decide which hypothesis fits with our study results best? Often times the seemingly magical target to match or surpass is a p-value of 0.05. That tells us that there is only a 5% chance of obtaining the data we did, or data more extreme than ours if the null hypothesis is true. In our case a p-value of 0.05 would mean that there was only a 5% chance of getting our data, or data showing even more difference between the placebo and ch-OSA if the placebo and ch-OSA really did have no difference in their effects. Why 0.05? Because that is what scientists have decided. They could have decided something else, and many others do use a different value. But 0.05 remains the usual p-value threshold of significance. 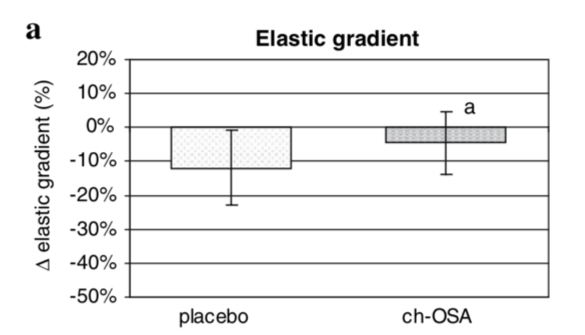 Looking at the study results we can see that the decrease seen in the elastic gradient of hair was significantly smaller in the ch-OSA group than in the placebo group. This would imply that the ch-OSA helped the hair stay stretchy. But, we can also look at the yield extension of hair, and see that it was significantly increased for both the placebo group and the ch-OSA group. This would imply that it was not the ch-OSA that caused the improvement in yield extension. Looking at hair diameter (the literal hair thickness) we can see that the hair of those who took the placebo did not significantly increase, whereas the hair of those who took ch-OSA did. So that is a good mark in ch-OSA’s book, right? Well, it is not as simple as proving significance. 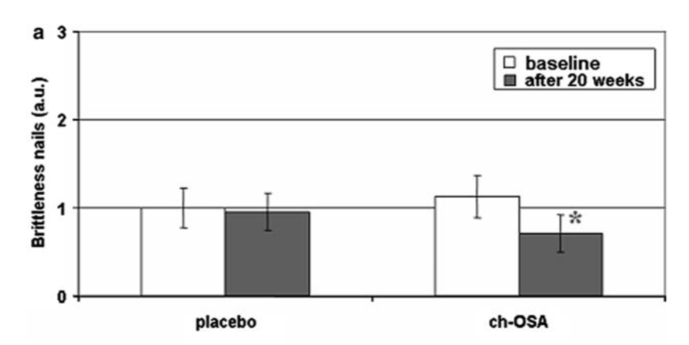 Something of concern in these results is the considerable amount of overlap between the placebo’s effects and the ch-OSA’s effects. Take a look at the graphs below. I’ve shown the range of results for the ch-OSA group in yellow, and the range of results for the placebo group in blue. Where there is green means that they overlap. The majority of each coloured section is green. This means that there was quite a noteworthy amount of people in the ch-OSA group who experienced the same effects as the placebo group, and vice versa. Do you really want to pay $25.99 plus tax per month for the chance to be in that little yellow bit? There is another thing we need to remember when looking at these results: statistical significance does not always equal practical significance. Those who took the ch-OSA saw a statistically significant increase in their hair diameter, sure, but did they notice it in the mirror, shower or at the hairdressers? Did their hair feel thicker to them? It is possible that the result was statistically significant but that, if asked, participants would say their hair felt no thicker to them, meaning that it was not practically significant. Do you really want to pay $25.99 plus tax per month for results you can’t even see? We can evaluate the practical significance of a result through something called the effect size. This measures the magnitude of a phenomenon and would give us an idea not just whether hair thickness improved but also by how much. Sadly, this study does not report an effect size (although judging by the percent increases in diameter of hair, I would guess that it is likely quite small). So, can ch-OSA make your hair thicker? Maybe. But also, maybe not. And probably not by that much. As for the other study the product cites, well, I’ll skip explaining the analysis of this one and cut to the chase. The second study showed that ch-OSA actually decreased skin hydration, although it did very slightly improve skin roughness, nail brittleness and hair brittleness. The problem again is one of effect size. Looking at nail brittleness, participants had the brittleness of their nails ranked from 0 (not brittle) to 3 (severely brittle). With ch-OSA treatment their brittle scores did decrease, but by very little. So, can ch-OSA help your skin be smoother, your nails be stronger, or your hair be thicker? If you are a middle-aged, healthy, white woman who does not treat her hair, maybe. A teensy bit. But if you are anyone else, we have no evidence to suggest so.